Fighters come in all shapes and sizes, and they don’t necessarily need to have four ounce gloves on to fit that description. Just ask David Rushing, a 30-year-old executive sous chef whose initial fight had nothing to do with stepping into the Octagon. Yet by the time he had begun making the journey from 413 to 201 pounds on ABC’s Extreme Weight Loss show Monday night, the UFC’s world famous eight-sided cage did become part of his fight to get closure on the tragic deaths of his younger brother and sister and begin a new and healthy life with his girlfriend of seven years, Kayla. “When I think of elite athletes and (being) fit, those guys come to mind instantly for me,” said Rushing of mixed martial arts, which he had been a fan of since he was ten years old. And he meant it, putting Rushing through an initial three-month boot camp that saw the St. Louis native survive a heart attack scare and injured foot to lose 118 pounds. He also began to get past the guilt he felt for the deaths of his siblings. When he was just 18, he left the house where he was the caretaker for his sister and two brothers, and the brothers got into their father’s gun cabinet and began playing cops and robbers. In the process, Ben was accidentally shot by his brother Chris and died. Six weeks later, his younger sister died in her sleep, with Rushing blaming himself for not giving Britney her seizure medicine the night before. Rushing ballooned up in weight, year after year getting bigger and bigger. When he finally had enough, he contacted Powell, who gave him the second chance he needed. During the early stages of the process, he got the chance to put the gloves on with Easton BJJ’s Nick Edwards in Colorado, where he learned the basics of MMA and even went through some sparring. 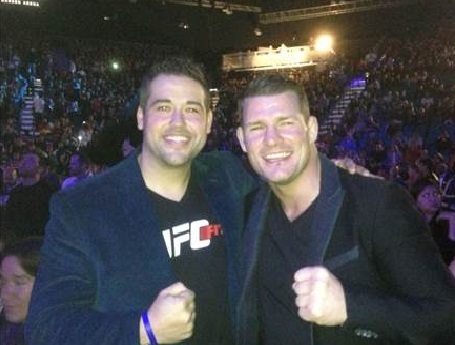 But the ante would soon be raised, as he was later brought out to Las Vegas, not just to meet the likes of Dana White, Urijah Faber, Miesha Tate, Vitor Belfort, and Michael Bisping before sitting Octagonside for UFC 168, but to go three rounds with Bisping in the UFC Training Center after the event. 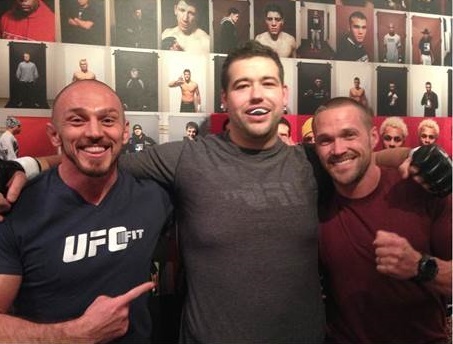 But with Powell and UFC Fit guru Mike Dolce in his corner, Rushing went through the fight of a lifetime with Bisping, scoring a third round takedown of the middleweight contender to win the match. And as Bisping made clear, he wasn’t doing any charity work in there. It was a symbolic as well as tangible victory for Rushing, who went on to finish up the yearlong challenge at 201 pounds and get engaged to Kayla. But more than the physical benefits, David Rushing got a new lease on life, winning his biggest fight along the way.